PPC experts know how important the ability to test and measure results is. Thankfully, we have the ability to do this with sitelinks as well. The ‘Ad Extensions’ tab within the Google AdWords UI offers advertisers data that is specific to sitelink performance. Also, keep in mind that all of this data is rolled up when viewing data for the campaign overall – there’s no need to add the numbers together to get the total, as AdWords already displays the campaign data in that way. One question I get often, however, is how advertisers can view more detailed data for sitelinks, such as conversion data or performance for individual sitelinks. 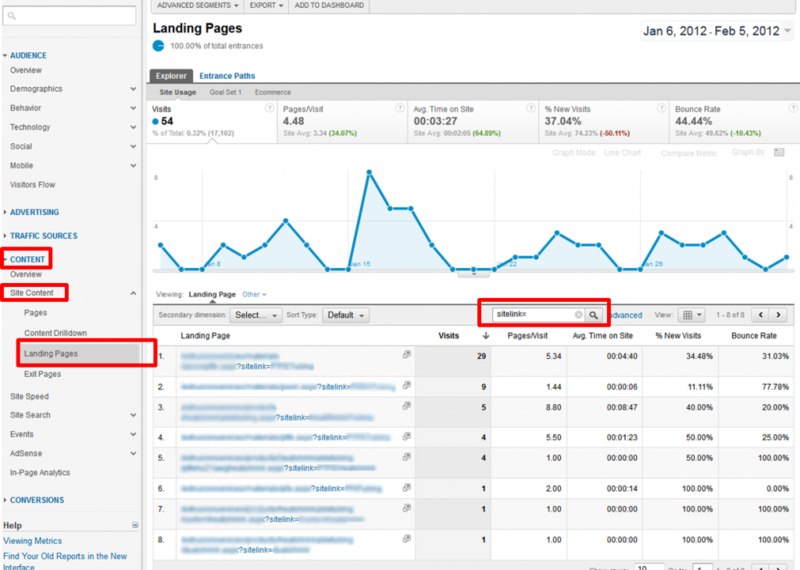 While we don’t have the ability to view this data within the AdWords UI, we can see it within Google Analytics. Remember, when attaching tracking parameters to any URL, use ‘?’ to separate the URL from the tagging if the URL does not already have a question mark in it; if the URL already contains a question mark, you’ll want to separate your URL from your parameter with ‘&’ (even if the URL already contains an ampersand). SearchEngineLand offers a great article on how to set up parameters. Once the parameters are in place and you have confirmed the link still works correctly, you can view data for sitelinks within Google Analytics by clicking on Content, followed by Site Content and then Landing Pages. Search for your designated parameter in the search box. From here, you can drill down in the Google Analytics interface to determine additional information about the sitelinks, such as which campaigns triggered them, etc. Another way to view sitelink performance within Analytics is to set up a custom report that will be saved within the analytics profile for quick viewing in the future. To do so, you’ll need to ensure that tracking parameters have been set up for the sitelink URLs (discussed above). 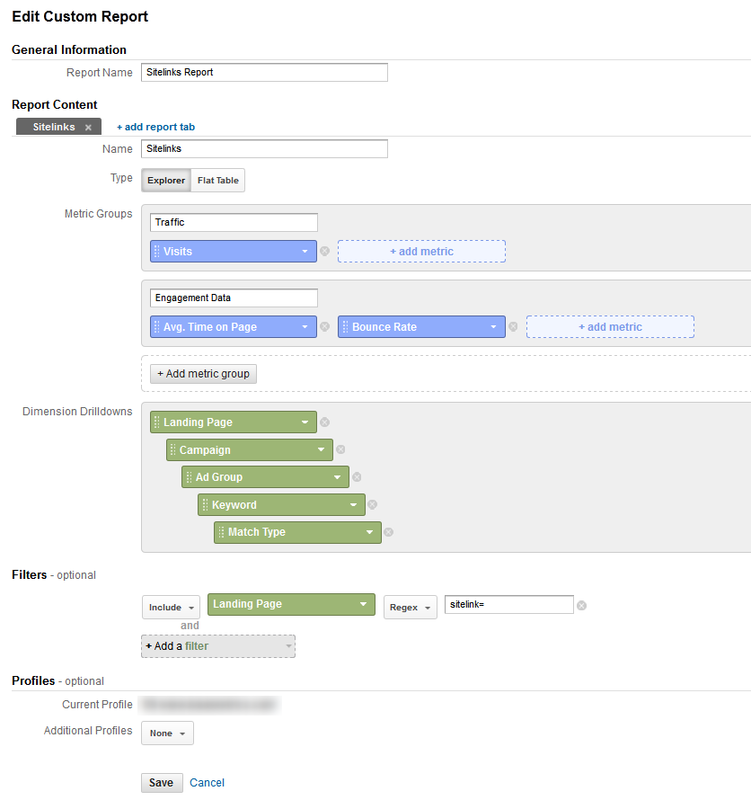 Within the Google Analytics profile you wish to track sitelinks in, click on Custom Reporting, then New Custom Report. Name the report so that you will be able to easily identify it as the Sitelinks report when you view the Custom Reporting tab (I always name mine Sitelinks Report). Since my sitelinks report usually only has one tab, I just name it “Sitelinks.” I also prefer to view the data by Explorer as the type. Choose the metrics you would like to view for your sitelinks – this can be limited to just visits, or as many metrics as you’d like, including bounce rates, time on site, etc. Metrics can be combined into one metrics group or multiple metric groups. Name your groups something easily identifiable. Next, you’ll choose the dimensions for which you’d like to see the sitelink data. I normally like to view campaigns, ad groups, keyword and landing page data at the very least. Note: Landing Page (Listed under Content) must be chosen for the custom report filter to work! The dimensions you choose can be basic like this, or contain more detailed data such as ad slot position, day of the week, medium, etc. You’ll then need to add a filter for the custom report to pull data for. Click Add Filter, then click Content, Landing Page. Ensure the first box says “Include.” Click the drop down box that says “Exact,” and click on “Regex.” Then, in the box to the right of that, type in the tracking parameter that you would like use to filter for sitelinks. I set my custom reports to filter for the word “sitelink” within the landing page, because my parameter contains that word. Click save, and you now have a Custom Report you can use to view sitelink information quickly. You will only have to make the sitelink report one time, but you can always update it to view more/less data. Implement sitelinks in your Paid Search campaigns, and use the AdWords UI and Google Analytics to track their performance.